"Allyson Rowe’s False Prophecy" was written by My 2 Cents, and is licensed under Creative Commons' Attribution - Share Alike 4.0 International license (a free cultural license). Allyson Rowe has a lot to say about how God speaks to her through dreams and other nebulous forms of communication. However, the prophecies she makes are fundamentally unfalsifiable, and therefore her viewers have no way of judging whether or not they are genuine. In this video, I point out the acontextual ways that Allyson uses the Bible, and how her prophecies are nothing but pseudo-spiritual nonsense designed to play on people’s emotions. Hello everyone, this is My 2 Cents. It’s been awhile, but today we’ll again be looking at the beautiful but not so bright, Allyson Rowe. I’ve criticized her in the past for preaching messages that teach young women to be victims and for giving poor relationship advice that will lead to irresponsible decisions, but today I’d like to focus specifically on her claim that she is a prophet, receiving specific supernatural guidance from God himself. As a disclaimer, I do not presume to question Miss Rowe’s motives. She may in fact sincerely believe that the dreams she has and the feelings she feels are communications from God, but her personal sincerity does not guarantee the truth of her claims. I find this to be important because whether we’re discussing religion, politics, economics or any other subject that has real consequences to living in the world, you have to have some objective means of testing whether or not what you’re claiming is true. As was brought up in my recent discussion with Dr. Bo Bennet, people often make unfalsifiable assertions on a whole range of subjects such that no observations could possibly prove them wrong. But just because a given assertion can’t be proven wrong doesn’t prove that the assertion itself is true, especially if there’s powerful evidence that indicates otherwise. In fact, even the Bible itself, which Allyson allegedly reveres takes the issue of prophecy and claiming to receive divine revelation from God very seriously. In Deuteronomy 18:22, the Israelites were told that if a person claiming to be prophet makes a prophecy and that prophecy doesn’t come true, it means the person in question is not really a prophet. Also, throughout the Biblical record, the messages of prophets are accompanied by supernatural signs specifically meant to validate their claims to prophetic status. Many of you watching may not believe that these Biblical accounts are historical, but none the less the religious believer and the atheist alike can recognize that prophets as described in the Bible are not simply people making ambiguous metaphorical claims about the future, but rather people delivering specific messages that are validated through supernatural signs or at least through the fulfillment of certain objective claims about the future. The video I’ll be critiquing was released at the beginning of this year, claiming that 2018 would be a year of abundance and favor. With this in mind, I want everyone watching to ask yourself, is Allyson Rowe making specific objective claims that can be validated now that the year is almost at a close? Or is she just spouting emotionally charged feel good nonsense that could be confirmed by any all observations this year. Let’s get into it. It’s interesting that she says that the Bible is her final authority since we’re about to see that she’s quite fond of taking passages out of context, developing pseudo-spiritual interpretations that have nothing to do with the verses in question, and she clearly pays no attention to what the Bible says about how you’re supposed to judge whether or not a prophet is genuine namely whether or not their predictions actually come true. Allyson is free to believe that Holy Spirit compelled her to focus on this verse in some supernatural fashion, but regardless of whether or not that’s true, the meaning of the verse itself is obvious to any reader. The verse is a reflective benediction by Paul after he had just spent the proceeding passage talking to the church at Ephesus about his specific role as a missionary to the Gentiles. Anyone picking up the Bible could understand what Paul meant when he penned these words and so Allyson is not providing some new specific insight into the passage that God specifically gave to her. Yeah, and last night I had a dream that I was to sitting on a beach in Aruba while this bikini model was walking around handing out free Corona’s. Do you think God is giving me a prophecy of the future? Now before you Allyson Rowe fans start saying that the dream I’ve just described is nothing like hers, I understand, but I’m pointing out that every single day people everywhere have all kinds of crazy dreams. It’s possible that Allyson’s dream is just the product of her subconscious and has nothing to do with divine revelations, so if Allyson is going to claim that the dream she received is actually some sort of divine message from God, the burden of proof is on her to substantiate that. Let’s see how she attempts to do so. Okay seriously. Allyson did you even read the rest of that passage to figure out what those verses are referring to? Since I did, allow me to give you a summary. 2 Kings 3 is a historical narrative that begins with Jehoram (Jeh Whore Um), the son of Ahab taking the throne in the Northern Kingdom of Israel. The passage states specifically that Jehoram was a wicked king who quote, “did evil in the sight of the Lord.” Jehoram found himself at war with the King of Moab and as a result teamed up with Jehosophat the King of Judah and the King Edom to go fight the Moabites. They made a seven days journey and as a result had no water for their armies or their cattle. Not wanting anyone to die of dehydration, the Kings sought out a prophet of God to inquire as to what they should do. Elisha was the prophet that they found, and although he did not wish to appear before Jehoram on account of his wickedness, Elisha did so for the sake of Jehosophat. Elisha then delivered a prophecy from God. He told the kings that they should dig trenches throughout the valley, and without any wind or rain, the valley would fill up with water, saving them from their predicament. Afterwards, they would fight the Moabites and would be successful. Following Elisha’s instructions, the armies dug the trenches. The next morning the prophecy came true and water flowed into the valley after which they defeated the Moabites. (Short Pause) Now whether or not you believe this is a true historical narrative, it’s clear that the passage in question is referring to a specific circumstance where God provided water for the armies of Israel, Judah and Edom. It is not a message to Allyson Rowe about something God is going to do in 2018. Further, there’s an objective nature to the prophecy that Elisha gives in this narrative. Elisha tells the kings to have their armies dig the trenches, and then says that afterwards two things will occur. The valley will fill with water, and their armies will defeat the Moabites. In other words, the kings in this passage have been given an objective prediction and they will know with certainty whether or not it has come true. Remember these details as you evaluate the prophecy that Allyson is about to give. Good for you, but the fact that you’re talking about these sorts of metaphorical droughts referring to hardships in modern persons lives only reinforces to me that you didn’t actually read the rest of the passage. 2 Kings 3:16-17 isn’t about God’s deliverance from personal hardships or even from literal droughts in general. It’s about a specific historical circumstance where God delivered the armies of Israel, Judah and Edom from dying of dehydration and then ensuring their success in battle. Now it could be that you believe God is telling you in our modern setting that He’s about to deliver some person or group of persons from various hardships in the near future, but much like the prophecy Elisha delivered in the 2 Kings passage I’d like to know specifically who is to be delivered, from what, and how we’ll know whether or not the prophecy comes true? Can you answer those questions? Granted, he says that afterwards, when they repent of their sin, he will restore them, which is what Isaiah 30:23 is referring to, but you know what it’s not referring to? Some sort of abundance, be it metaphorical or literal, in the year 2018. In fact, even if you were claiming that the pattern in this passage is going to repeat itself in our modern setting that would mean there’s great calamity on the horizon prior to whatever blessings and restoration God promised in the future. Also, I again notice that there’s an objective nature to Isaiah’s prophecy. If they face destruction and judgment followed by repentance and restoration, Isaiah’s prophecy will have been shown to be true. If the Egyptians do come to their aide and they face no such judgement, the people will know that Isaiah is a false prophet. Yeah as a matter of fact, in the very passage you just referenced, Isaiah stated there was going to be a great deal more death and destruction before there was a repentance and subsequent blessing. And the words He spoke were objective prophesies such that the people could judge whether or not they came true. The Biblical passages you referenced were delivered to specific groups of people under specific historical circumstances, and once read in context, it’s clear they cannot be referring to something in 2018. However, if you’re claiming that these passages are in some way parallel to a new prophecy that God gave you about the year 2018, my question is again, what specifically is going to happen and how will we know whether or not your prophecy has come true? Still waiting on that. Lot of spiritual sounding happy words in there, but it’s still not clear to me specifically what your prophecy entails. What do you mean by revival? That can mean a lot of different things in a religious and specifically a Christian context. And what bad things are going to be made good? Oh, so this prophecy has a qualifier? In order for this abundance to occur we need have quote, “spiritual vision.” Now admittedly, I’m not quite sure what Allyson means by that, but I suspect she threw this statement in here in order to make her prophecy unfalsifiable. If there isn’t a great abundance like whatever she has in mind, or someone comes to her at the end of 2018 and says that they never saw a fulfillment of her prophecy, she can always claim, “Well it’s just because you didn’t have spiritual vision.” Guess we’d only know if she laid out some sort of objective measure for determining whether or not a person has enough spiritual vision. (Charlie Brown wa wa wa) Again, lots of encouraging spiritual words. Revival, multiplying the harvest, bestowing favor, fulfilling promises, but again, WHAT SPECIFICALLY IS GOING TO HAPPEN AND HOW WILL WE OBJECTIVELY EVALUATE WHETHER OR NOT YOUR PROPHECY HAS COME TRUE? For example, let’s suppose that when this video was first released there was someone watching whose mother was struggling with cancer. Now if in the course of 2018 his mother makes a stunning recovery that no one expected, maybe he’d conclude that this was a fulfillment of Allyson’s prophecy. But on the other hand, if her condition got worse and she ultimately passed away in 2018, he could always conclude that…well…he grew closer to God because of the experience and maybe some of the people who knew his mother were inspired by her in her last days and so that was the fulfillment of Allyson’s prophecy. My point is that unless Allyson gets more specific, it seems that any and all future observations by any person could be interpreted in some fashion that she could claim that her prophecy came true. It’s not an objective claim about the future that can be tested. It’s just a bunch of pseudo-spiritual gobblygoop designed to make people feel good. And don’t forget, if someone comes to Allyson and tries to claim that her prophecy didn’t’ come true, she can always claim that that person didn’t have enough “spiritual vision.” It’s no different than when Socialists claim that all the failed socialist nations in history just didn’t practice REAL socialism. And I again have to question how much time you’ve spent reading the Word of God given you’re a-contextual use of so many Old Testament passages. Well, 2018 is almost at a close, it’s November as I make this video, so I’m going to ask everyone watching to take an objective step back and ask yourself. Did Allyson’s prophecy come true, and further, what observations would have shown us that it didn’t? Now if my past videos critiquing Miss Rowe are any indication, I expect there will be a lot of triggered Allyson Rowe fans saying things like, “Sounds like you need to read the Bible.” “Satan is attacking Allyson through you.” “You just secretly have a crush on Allyson which is why you criticize her.” And to all of you, I just have to say, if you can respond to any of the specific claims I’ve made in this video and show that I’m incorrect, I am more than happy to admit it. If you think calling me names, questioning my motives, or claiming that you’re holier than I am is going to change my or anyone else’s mind, well, then quite frankly, you’re not as intelligent as you think you are. To sum up. 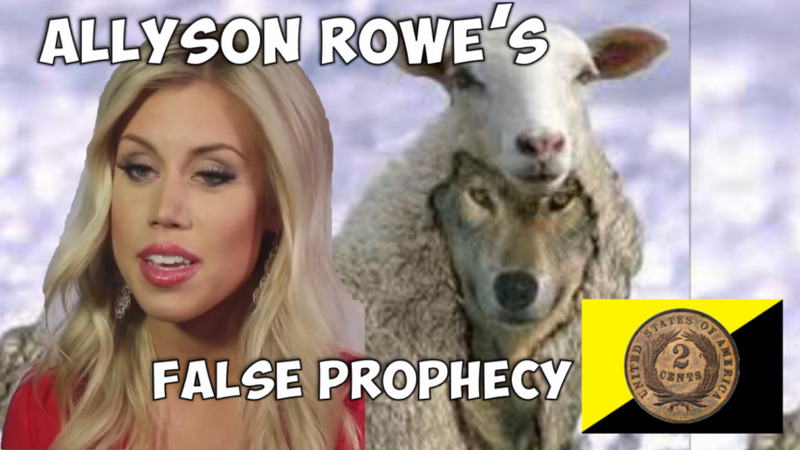 Allyson Rowe’s prophecy has been delivered in such a way that it can’t possibly be proven true or false by any observation. It’s really no different than the claims of modern Marxists about the inevitable success of Communism. If you’re going to claim you’re receiving direct supernatural revelation from God, you better be prepared to provide objective testable criteria by which we can validate your claims.